“Nearly 90,000 Hondurans who have lived in the US at least two decades could be forced to leave the country after the Trump administration decided Friday to end protections for the immigrants that go back to the 1990s. 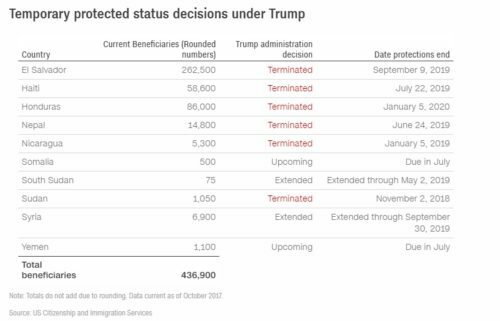 The move brings the total number of immigrants for whom the administration has decided to end temporary protected status in the last year to more than 425,000, many who have lived in the US legally for decades, according to numbers from US Citizenship and Immigration Services. Click here to read the full story published by CNN.